How and Where to Buy Albuterol? Canadian Pharmacy World offers Albuterol with a valid prescription from your doctor at a reasonable price. Our Canadian Dispensing pharmacy carries RX and OTC medications online. Visit us online today at CanadianPharmacyWorld.com and place your order. Are there Alternative Names for the Brand and Generic Albuterol Inhaler? The brand name Albuterol also called Ventolin comes from Turkey and is manufactured by GSK. 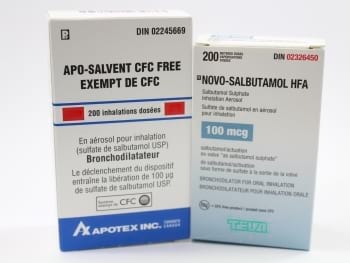 The generic Salbutamol comes from Canada manufactured by Teva (Novo-Salbutamol) and Apotex (Apo-Salvent). We also carry the generic from UK manufactured by a different manufacturer and India also called Asthalin manufactured by Cipla. What Dosages and Forms is Albuterol available in? Albuterol is available in the form of 100mcg/200dose CFC free inhaler. The generic Salbutamol is available in 100mcg/200dose inhaler and 0.5mg/ml/ (20x2.5ml) and 5mg/ml/10cc solution pack. What is Albuterol used for? Albuterol inhaler (Salbutamol) is a bronchodilator that is used to treat or prevent bronchospasm in people with reversible obstructive airway disease. It may also be used to prevent exercise-induced bronchospasm. Salbutamol belongs to the class of medications called bronchodilators or B2-adrenergic agonists. This medication works by relaxing the muscles in the walls of the small airways in the lungs. This makes breathing easier because it opens up the airways. Albuterol inhaler should be used in adults and children who are at least 4 years old. Albuterol is a short-acting inhaler. The usual dose of Albuterol Inhaler is two puffs every 4 – 6 hours. Are there any Precautions and Drug interactions for Albuterol? You should not use Albuterol if you are allergic to Salbutamol or any of the ingredients in the medication. Before you start using this medication, talk to your doctor about your medical history and about all the medications you take including OTC and herbal medications. It is unknown whether Albuterol will harm an unborn baby. Inform your doctor if you are pregnant or plan to become pregnant. It is unknown whether Albuterol will pass into breast milk or if it could harm a nursing baby. Inform your doctor if you are breast-feeding a baby. This drug may make you dizzy. You should not drive, use machinery, or do any activity that requires alertness until you are sure you can perform such activities safely. Limit alcoholic beverages. There may be an interaction between Salbutamol and other medications such as atomoxetine, beta-blockers, betahistine, carvedilol, digoxin, dopamine, epinephrine, theophylline, etc. This medication should be at room temperature away from moisture, heat, or cold temperatures and out of reach of children.